Don't forget we have the "Red Carpet" day Saturday June 26th in downtown Collingwood... Browse around the shops- we have our dresses & skirts on SALE!! Words of wisdom:Life is too short to knit with yarn you don’t love.Stash building - almost as much fun as knitting.Why spend $12 on lunch when you can buy a skein of yarn and eat an apple? Live Latin music and entertainment... head to the Village on the shuttle bus to join in more FUN!! Naturally yarns for Fall.... WOW!! We saw new yarns, colours, samples- and other LYS owners- so nice to put a face to the name!! All Red & White clothing 50% savings!! Clearance tent items- Odds N Sods - Good deals!! 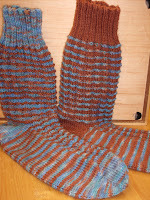 Our Shelridge - Cabin Fever "Ridges" Sock that rocks!!! I had so much fun choosing from my Shelridge sock yarn bin. What about the black/grey variegated with the hot pink- my version of Licorice Allsorts :) That would be cute... what about the Scottish Highlands- shades of purples, lichen, greens with the lichen or green contrast... that would work too.... I settled on Deserts of Tucson... turqs, rust browns with touches of blues :) that's it!!! And here it is.... Heather Hufton has created this beauty exactly to pattern. Brenda and I were teasing her about switching up the contrast colours- but as you can see by the finished socks- we have two opposite colourways- and I love it!! Collingwood's Pine Street- new "Yorkville"
Stop by our natural wool shop too- you'll be glad you did..